It’s always good to plan and planning your blog’s income generation is a must for success. The same can be said for Affiliate Marketing. Planning out an Affiliate Campaign at the right moment can lead to increased revenue and better click-through rates. Plus, you won’t sound sleazy or spamming because your strategically planning a post at the right moment. Read on to see what I mean and SNAG your copy of the Free Affiliate Marketing Planner. Note: This informative post contains a link to Michelle Schroeder-Gardner’s course, Making Sense of Affiliate Marketing. I took the course which has helped me increase my Affiliate Sales. I highly recommend it! 1 Why use an Affiliate Marketing Planner? 9 How to use the Affiliate Marketing Planner? 11 Need More Blog Monetization Strategy Ideas? Why use an Affiliate Marketing Planner? Not sure which Affiliate to promote? No problem, the Affiliate Marketing Planner will give you a clear outline of what to promote and when to promote it. Strategically, plan out your Affiliate Campaign a month in advance. A great benefit of using this Affiliate Marketing Planner is informing your audience of an opportunity at the appropriate time and with good reason. For example, The American Business Women’s Day is 9/22. What a great reason to reach out to your audience and celebrate this great day. The time is also right to promote Starting a Blog and Self-Hosting Platforms to start a blog. An Affiliate Marketing Planner can also help you recirculate older Affiliate Posts and give them new life. Revive older posts at the appropriate time to continue generating revenue from that affiliate. Planning out your Affiliate Marketing Campaigns strategically allows you to research on the best affiliate to promote. You can also implement the best method to promote the affiliate whether it be a round-up post, case study, review, interview, or tutorial. You also can research how other bloggers have promoted the affiliate too. Reach out to the merchant’s Affiliate Manager for tips on best practices of promoting the Affiliate. The manager may issue you an additional discount if promoting or a sale on the product if on a National Celebration Day; which the merchant will more than likely celebrate too. If not, you brought it to their attention and they will more than likely move on it. A great example is National Proofreading Day on March 8th. Grammarly is sure to promote this day with a site-wide sale. With an Affiliate Marketing Planner that outlines days dedicated to a special event or product, you have a reason to email your audience in celebration of the special day. Regardless of niche, you can celebrate a special day from National Ice Cream Day to National Unicorn Day. Whether your promoting an Affiliate or simply sharing a great post on memories of making ice cream or great pins you found on ice cream flavors, its an excellent way to engage with your readers. You can also use the Affiliate Marketing Planner to engage your social media pages and groups. For example, on The American Business Women’s Day, would have been a great time to celebrate your follower’s businesses or promote their success stories. Having planned out Affiliate Campaigns strategically can help you gather data on what resource and tools your audience needs. If you see a trend that a certain Affiliate is getting better traction than the rest, you can increase the promotion of that Affiliate to better serve your audience. How to use the Affiliate Marketing Planner? Decide what Affiliates to use to promote the days chosen. Research! Plan out how to market your Affiliates on the National Day Chosen. Ideas can be a round-up post, email to your audience, social media platforms, comparison, case study, review, interview, or tutorial. Use a national day to engage your social media pages or groups. Or use the day to promote a product of your own. Coincide Pinterest create a new board, group or find pins to help market your post. Remember to contact your merchant’s affiliate manager if there are any incentives for the month to add to your affiliate marketing efforts. As I mentioned earlier in the post, I took the course on Affiliate Marketing offered by Michelle Schroeder Gardner. Michelle blogs at Making Sense of Cents and makes nearly $100,000 a month on her blog. I took her course and it’s helped me increase my blog revenue. I highly recommend it! Check out the course modules and see if it's a good fit for you! Need More Blog Monetization Strategy Ideas? I hope this Affiliate Marketing Planner will help you in running a successful Affiliate Marketing Campaign. A strategic campaign can enable you to maximize your earning potential with Affiliate Marketing. These are some great points! 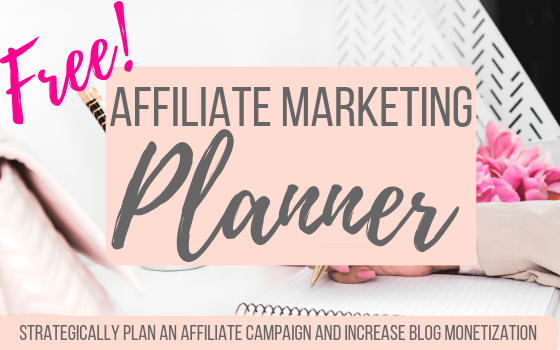 I never even considered an affiliate market planner until now. Thanks so much for sharing! Thank you Bethany! I hope it’s helpful to you!